A place of a mighty historical significance like few others: this is the venue where the Potsdam Conference was held in 1945, in which the post-WWII world, and especially the fate of the defeated Germany, was decided on by the leaders of the victorious Allied powers USSR, USA and Great Britain. The Cecilienhof palace, in Potsdam, just outside Berlin in eastern Germany, is now a prime tourist sight, especially the hall in which the conference was held as well as the other rooms in which the three delegations had their own separate quarters. More background info: Schloss Cecilienhof was the last palace built during the reign of the Hohenzollern (see under Potsdam): construction was begun in 1913 and finished in 1917, just a year before the end of the First World War, when the Emperor had to abdicate and the monarchy ended and instead the Weimar Republic was founded in Germany. The palace had been commissioned by Emperor Wilhelm II as a residence for his son, and heir to the crown, also called Wilhelm, and his wife Cecilie – hence the name of the palace, which translates as 'court of Cecilia'. Before they moved in, the couple resided in the nearby Marmorpalais. Quite in contrast to the latter's Rococo exuberance, Cecilienhof was constructed in a more modest fashion similar to that of Tudor manor houses in Britain – apparently the style was en vogue at the time and fitted well into the English landscaped garden style of the Neuer Garten park. Even though Crown Prince Willy never made it to becoming Emperor Wilhelm III, and there was a period of uncertainty about what was to become of the former monarchy's estates, he and Cecilie were eventually allowed to move back to Cecilenhof in the mid 1920s. Even though the former Crown Prince was nominally obliged to stay out of politics, he initially supported the rise to power of the Nazis, and Adolf Hitler personally visited Wilhelm at Cecilienhof a few times shortly before and after becoming Reich Chancellor. But Wilhelm later distanced himself from the dictator (once he realized that the Führer would not be an instrument in getting the monarchy restored). By the end of WWII, Wilhelm and Cecilie had both moved away and their palace was seized by the Soviets. And as Berlin was too heavily damaged at the end of the war, the Soviets proposed Cecilienhof in Potsdam as the venue for the victorious Allied powers to have their third summit (after Tehran and Yalta) to consider the post-war fate of Germany. 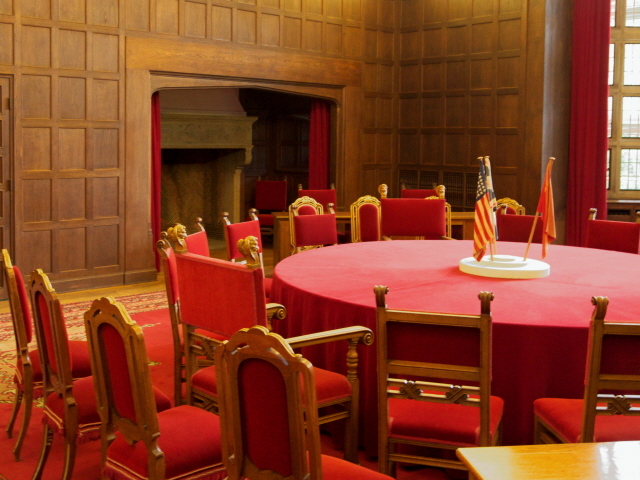 The Soviets specially adapted the palace for the meeting, including a custom-made large round conference table as the centrepiece of the grand hall. The Soviets also provided a buffet for the delegations, who all had their separate secretariat rooms, with separate entrances, in the wings to the side of the central hall. And so in July and August 1945 the Potsdam Conference was held at Cecilienhof (even though the official name “Berlin Conference” was nominally retained). It was here that Josef Stalin, Winston Churchill, and later his successor Clement Attlee, as well as US president Harry S. Truman discussed the future fate of defeated Germany and its division into four occupied zones, considered the issue of reparations, declared a programme of denazification and a pledge to hunt down war criminals (see Nuremberg) and redrew the country's eastern border as the "Oder Neiße Line" which meant that Poland was moved a whole lot westwards, as its eastern territories remained in Soviet hands). During the Conference, US president Truman also let on that the USA now had a new "powerful weapon" – without actually specifying that he meant the atomic bomb. Nevertheless, he authorized its use on Hiroshima while at Cecilienhof, over the phone! Not only did that herald the end of the war in the Pacific – it also marked the onset of the Cold War. After the Conference, Cecilenhof remained in Soviet hands as a club house for a few years before the palace was handed back to the newly founded “brother” state of the GDR. The East German government subsequently used the site as a reception centre for state visits. As early as 1952 a memorial commemorating the Potsdam Conference was set up here too. Most of the building's 176 rooms, however, became a hotel from 1960 onwards – even though the splendid views over the Jungfernsee lake became rather tarnished by the fact that from 1961 border fortifications of the Berlin Wall ran right along the shoreline in front of the palace. After the fall of the Wall and Germany's reunification, the palace was still used as a memorial museum, which was expanded and refurbished in 1995. The hotel part was eventually taken over by a private investor and thus became part of a small chain of luxury hotels. 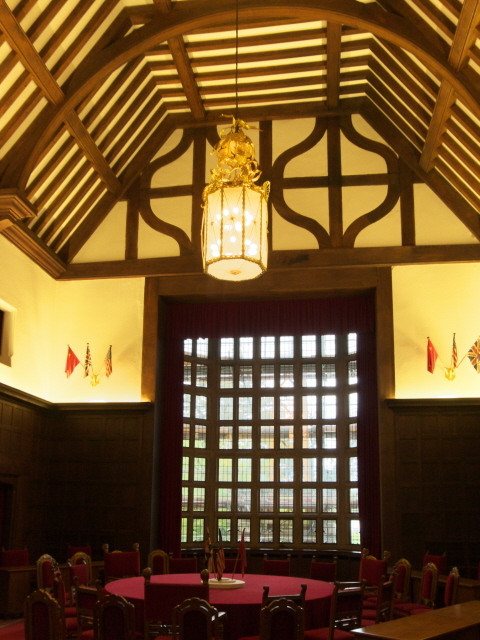 The whole venue was also used for the G8 foreign ministers' summit in 2007. Before that, an especially famous guest was Queen Elizabeth II in 2004. Since 1990, Cecilienhof has been part of the UNESCO World Heritage Site that also includes the other Prussian palaces and parks of Potsdam and Berlin, such as Sanssouci, the Neues Palais and the Marmorpalais – see under Potsdam. 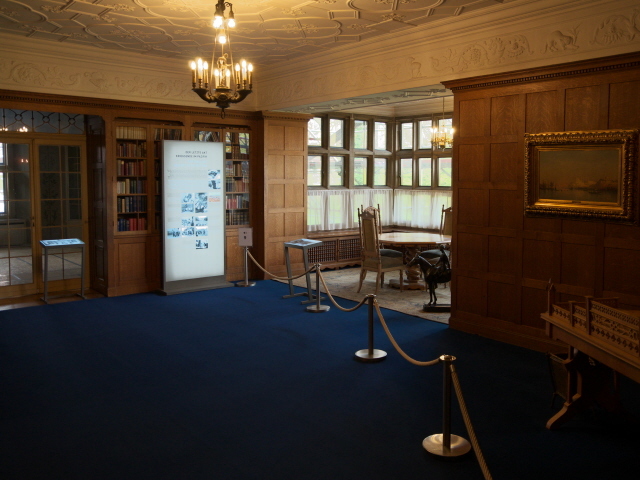 More recently, the museum commodification of Cecilienhof, especially of the Potsdam Conference exhibition parts, was given a complete overhaul and redesign that was opened again in 2012. What there is to see: The building as such is surely quite impressive, in a certain understated kind of way (rather than the in-your-face pomp of the Baroque palaces of the Hohenzollern monarchy elsewhere). However, when I visited in April 2017, most of the façade was covered in scaffolding, so this impression was quite marred. In the gallery below I therefore added a few photos of the outside of the palace that my father took a few years earlier, before the refurbishment work (see above) began. 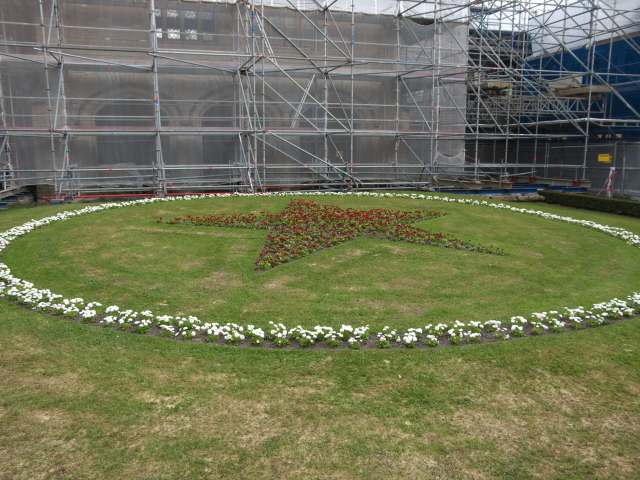 The outside doesn't give much of an indication of the palace's momentous role in history, except for one rather large detail you can find if you enter the central courtyard: here you can still see the flower bed forming a Soviet red star that the Soviets had planted just before the Potsdam Conference! In theory you could go through the museum's rooms without using an audio-guide and just read the information panels, but for once I “obeyed” and also used the player to the full here. Normally I'm not a great fan of such devices, but I have to admit that the narration was quite engaging and did provide additional insights that the written commodification alone would not have covered. Both the audio-guide narration and the text-and-photo panels of the exhibition go beyond just the Potsdam Conference and also cover the palace's prehistory as the residence of the Hohenzollern Crown Prince and his wife Cecilie. The building as such, despite its traditional outward appearance, was then state-of-the-art in terms of structural architecture (built around a steel frame) and the interior design and fixtures. The exhibition also provides an overview of the run-up to WWII, the rough timeline of the course of the war and a summary of the various conferences before Potsdam, including the two summits of the Big Three Allied powers in Tehran and Yalta. One special room you can see en route to the Potsdam Conference part is what used to be Cecilie's breakfast room. And this is quite remarkable, namely in that it is designed like the cabin of a passenger ship! 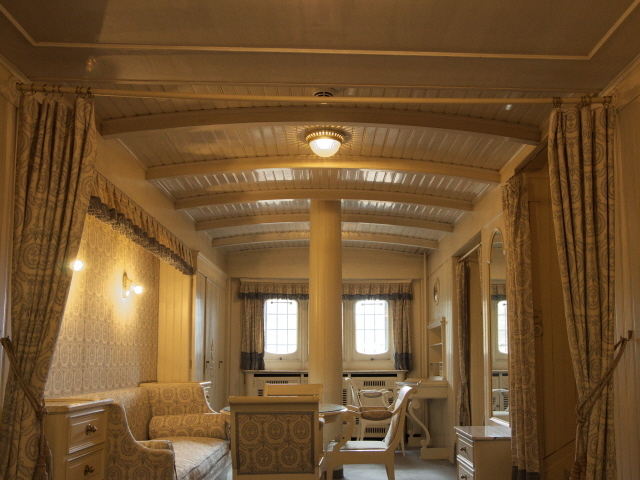 In fact parts of the interior design as well as the windows were taken from an original ocean liner of the time. 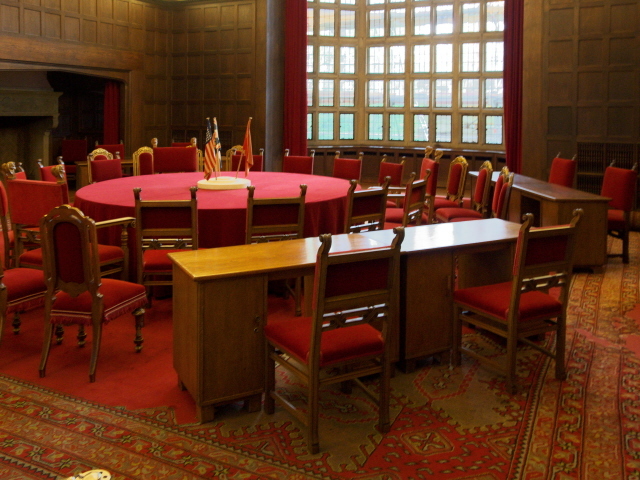 The first room directly associated with the Potsdam Conference is the White Salon. This former music salon was used by the Soviets as a venue for receptions and for the buffet they supplied to the other delegation at the beginning of the Conference. To the right of this are Stalin's rooms, furnished in a modest but sturdy style, including his massive wooden desk. To the left beyond the White Salon is the heart of the whole place: the grand Conference Hall. This high-ceilinged, chandeliered, representational hall still has the original round conference table in its centre with a ring of chairs and desks and seats for the conference shorthand writers/minutes-takers. The trio of the national flags of the Soviet Union, the USA and Great Britain are placed on the table and also adorn the walls. Various information panels provide details from the Conference and also little anecdotes around it. 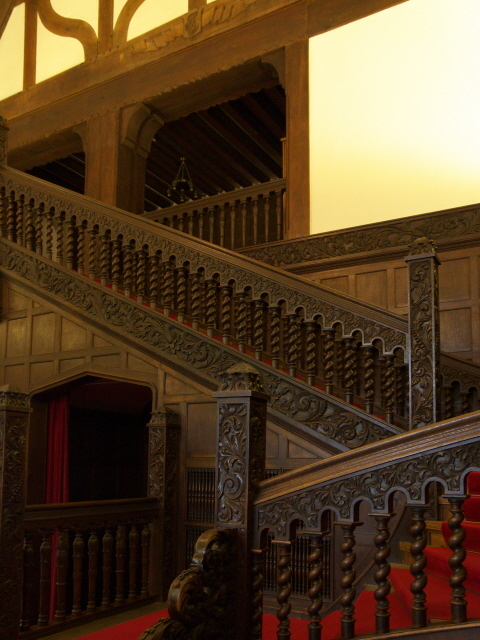 One such story concerns the grand wooden stairs that lead down from the first floor to the conference hall. Theoretically, this would have been the most natural way for Winston Churchill to make his way down here from the British delegation's offices upstairs. However, the Soviet hosts insisted that he had to make his way in a very roundabout way in order to use a side entrance. The reason? Since the Soviet and American delegations occupied rooms on the ground floor and thus had to enter through side doors, Churchill would have appeared privileged had he been the only one to make his entry to the Conference via the grand stairs. And the Soviets wouldn't have had that. 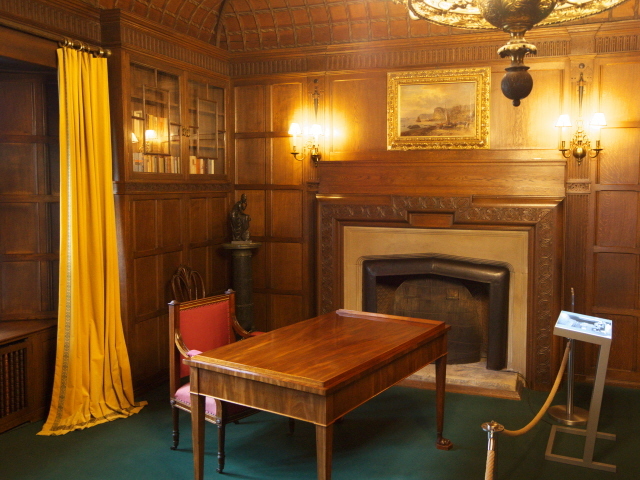 Through to the other side of the conference hall comes Churchill's (and later Attlee's) personal office set up in the palace's library. This was the only room for the British on the ground floor. Next door to this follows US president Truman's room, furnished in part with items from the nearby Marmorpalais, e.g. 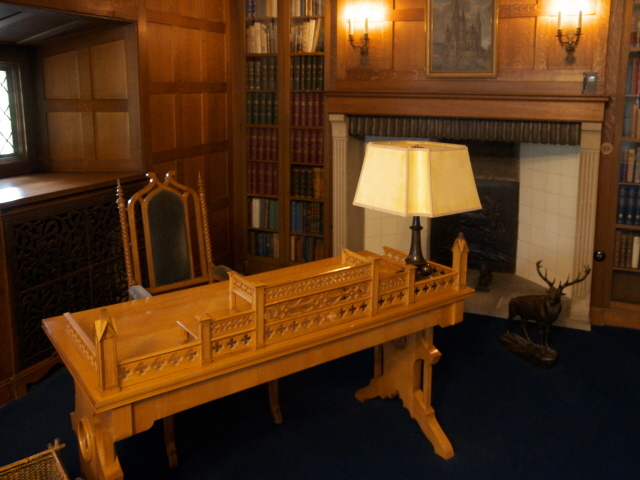 the finely carved writing desk. Following the tour through these conference and delegations' rooms, the exhibition adds a section about resistance within the Third Reich, including the well-known assassination attempt on Hilter by Stauffenberg (cf. Wolfschanze and German Resistance Memorial Centre). Then you step out again into the courtyard. If you wish you can also view some of the private rooms of Crown Prince Wilhelm and his wife Cecilie, but since this part is unrelated to the palace's main historical significance, I gave that option a miss (but see below). All in all: what makes this place so special is that it is one of those few sites where you can really feel the heaviness of history. The implications of the Conference were so wide-ranging, such an important factor in determining the way history went for at least the next half century, that it doesn't fail to send a certain shiver down your spine, especially when you enter that grand Conference Hall. The way all this is commodified today is also commendable – detailed and illuminating enough but not too in-depth, and also just the right balance between being factual and sober on the one hand, but also offering little entertaining aspects and anecdotes weaved into the narrative. Highly recommended! The only problem with this site is its popularity, though. When the throngs get thick, it can get a bit uncomfortable – and crowd management may even mean you won't be let in until the worst of the throngs have thinned out sufficiently. When I visited I was first turned away, or rather: told it would be a long wait, and so decided to come back the next morning instead. When I did I was able to go straight in (the place had just opened), but I was quickly overtaken by a large group of Chinese tourists on a guided tour. So I had to wait behind them a little before I could finally get to the grand hall, for instance. But then there were thankfully far fewer other visitors there. I guess overall I was lucky, then. Location: inside the Neuer Garten park, at its northern end, some 3 miles (2 km) from the centre of Potsdam, Brandenburg, Germany. Access and costs: a bit outside the centre of Potsdam, but still walkable; not too expensive. Details: To get to Cecilienhof from the centre of Potsdam you can actually walk it. It takes about half an hour and at least the second half, through the Neuer Garten park is very pleasant – to say the least … it's actually a veritable attraction in itself (see below). Alternatively you can get a bus, line 603, that runs every 20 minutes from Platz der Einheit in the centre of Potsdam. The stop closest to Cecilienhof is called Höhenstraße and is actually the terminus of that line, so you can't miss it really. The bus stop is by the car park a mere 250 yards or so from the entrance. Opening times: Tuesdays to Sundays from 10 a.m. to 6 p.m. in the summer season (April to October), only to 5 p.m. in winter; closed Mondays (except for certain public holidays) as well as over Christmas Eve/Day. Admission: 6 EUR (concession 5 EUR), including the (obligatory) audio guide. Audio guides are available in a large range of languages, not only German and English and the usual set of European languages but also Polish, Russian, Hebrew, Japanese and Korean. There are also various combination tickets, e.g. with the Marmorpalais (see below), or Sanssouci (see under Potsdam). A photo permit costs an extra 3 EUR. NOTE: Cecilienhof is a popular tourist sight; at times it can get very busy here, so that you may have to wait a while before being allowed in. Combinations with other dark destinations: In general see under Potsdam. One of Potsdam's most significant other dark sites is just a short walk from Cecilienhof: the former KGB prison at Leistikowstraße, half a mile (800 m) to the south-west. A similar distance to the north of Cecilienhof stands a relic of the former GDR border fortifications: a watchtower (called “Bertiniturm”) at a former inland waterways checkpoint – see under watchtowers and Berlin Wall. Also still within walking distance is the Glienicke Bridge, a top-notch Cold-War-era site (with a museum too), about a mile (1.6 km) to the south-east along a pleasant route through the park and on a waterfront path. Combinations with non-dark destinations: Obviously the Neuer Garten park that Cecilienhof sits in is the most natural combination. Most of it stretches out to the south and includes the picturesque Marmorpalais and a few follies (including a pyramid! ).